Following on from Edward Scissorhands, which was set at Christmas and Batman Returns, which was set at Christmas, for something completely unexpected Tim Burton produced, based on his own story The Nightmare Before Christmas, which was surprisingly set at Christmas. The Nightmare Before Christmas is an excellent, but baffling film, despite seeing it many times, I have absolutely no idea what it is trying to do and who it is supposed to be aimed at. At face value it’s an animated musical that is possibly aimed at children, but the animation and story are possibly too scary for kids and like far too many musicals, the songs are entirely expository and completely forgettable. The movie starts in Halloween Town, with the assorted ghosts, goblins, ghouls and monsters celebrating another successful Halloween. The brains behind Halloween, Jack Skellington aka the Pumpkin King reveals via song, because that’s pretty much how this movie goes, that he is bored with the monotony of the same thing year in and year out and wants something more. Wandering through the woods, Jack finds seven trees that mark portals into the different holiday worlds. Entering Christmas Town, Jack is so in awe of the colour and the joy of Christmas that he sings about it, although that’s not really any kind of a surprise… I’m pretty sure that Jack would burst into song after a particularly satisfying bowel movement, hell, he’d almost certainly burst into song after an appalling one. Superpsyched about Christmas, Jack returns to Halloween Town and can’t wait to tell the assembled ghouls and ghosts about his discovery, unsurprisingly by song. However, they fail to understand what he is talking about and twist it around to make it sound horrific, until in an attempt to sway the population he turns Father Christmas into a fearsome beast called “Sandy Claws”. Using “The Scientific Method”, Jack dissects Christmas in order to properly understand it and after much consideration, tells the residents of Halloween Town that they will manage Christmas this year. He does this through song, but you probably guessed that. As Halloween Town’s preparations to take over Christmas are in full swing, Sally the sad stitched together rag doll has a premonition and warns Jack that he should abandon his plans for Christmas as they are destined for disaster. Probably too focussed on what he was going to sing about next, Jack ignores Sally’s advice and sends out Lock, Shock and Barrel to kidnap Santa Claus. After an initial false start where they kidnap the Easter Bunny, Lock, Shock and Barrel leave Santa Claus with the disturbing Oogie Boogie who wants to take over Halloween Town. It’s possible that he sings about it. As Christmas Eve arrives Sally creates a wall of fog to try and stop Jack from leaving in his sleigh, but with the help of Zero the ghost dog with his red nose, Jack is able to navigate his coffin sleigh into the world. What follows is the highlight of the film for me, as Jack delivers an array of terrifying “presents” to children across the world. As the various presents horrify or try to kill the children who receive them, complaints start flooding into the police until Jack’s sleigh is shot out of the sky in order to end his reign of terror. Crashing safely to the ground, Jack realises that he needs to right his wrongs and heads back to Halloween Town in order to free Santa Claus and save Christmas. I’m pretty sure he says much of this in song. Jack rescues Santa and Sally from the clutches of a musical number by Oogie Boogie and sends Santa on his way to save Christmas. 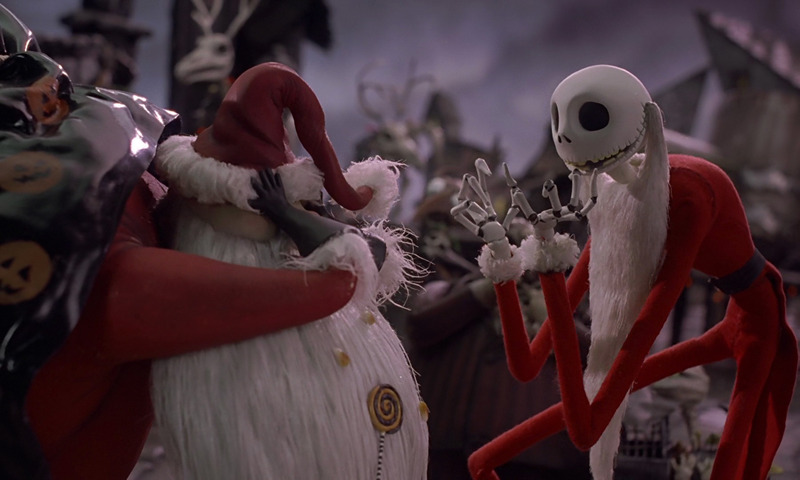 As Santa replaces the terrifying presents from Halloween Town, with those made by the elves in Christmas Town, the residents of Halloween Town celebrate Jack’s return. Santa sends snow to Halloween Town as a sign of reconciliation enabling them to understand and celebrate Christmas. In the midst of a song Sally and Jack declare their love for each other. 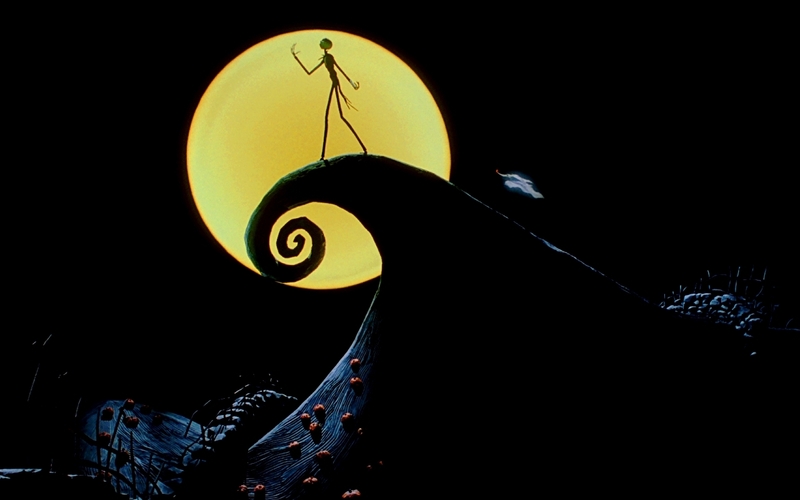 I guess if you want to talk about holiday movies, there’s no holiday movie that’s more holiday movie than The Nightmare Before Christmas, I mean it has seemingly every holiday wrapped up in it at one point, with Jack Skellington choosing between portals into Valentine’s Day, St. Patrick’s Day, Easter, Thanksgiving, Christmas, Halloween and Independence Day. That said, The Nightmare Before Christmas is somewhat confused about which holiday it’s actually about, I don’t think there’s too many other films that feature not only Santy Claws, but also the Pumpkin King and the Easter Bunny… Despite the title, if I was forced to associate a holiday with The Nightmare Before Christmas, I’d absolutely have to say that it is a Halloween film, given that the population of Halloween Town work together to (unintentionally) ruin Christmas. Subsequently, as entertaining a film that it is, as a Christmas film, I can only really give it three out of nine reindeer. Perfect Halloween film though.